Formulated with the highest quality raw materials, Zipset UV Paper inks are in a class of their own. High transparent pigment concentrations produce sharp dots, excellent trap values, and outstanding mileage. This advanced formulation allows for wider water tolerance, which results in added stability on extended press runs. Specifically designed raw materials offer extended shelf life, while reducing swelling to blankets and rollers. Strong inks produce minimal ink films which require less energy to cure. 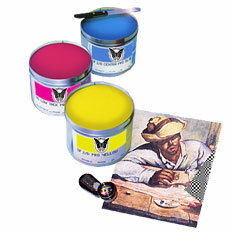 Zipset UV Paper inks offer great performance on a wide variety of stocks.